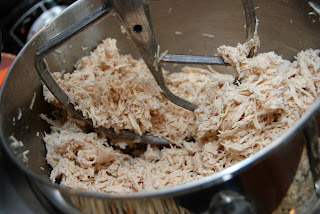 Yesterday, in my Best Use for a Kitchen Aid Mixer post, I showed you the quickest way I have found to shred chicken. 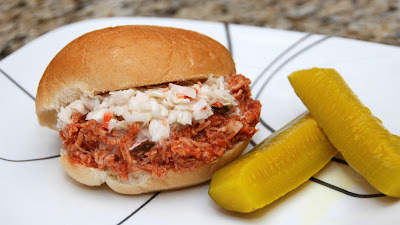 Today I am going to share the chicken pull recipe the shredded chicken was for. This chicken pull makes a delicious sandwich. I like to eat it topped with coleslaw or ramen noodle salad for a little extra tang. Boil your thawed chicken breast for about 20 minutes, until cooked through. While your chicken breasts are cooking, in a large stock pot or crock pot (I use a 6qt. crock pot) over medium heat; mix the ketchup, salsa, taco sauce and brown sugar. (I generally add 3/4 cup brown sugar and only add more if I don't think it tastes sweet enough.) Allow the mixture to heat throughout, stirring occasionally. Do NOT boil. This is a good point to taste your mixture and add the remaining brown sugar if you find it necessary. If you find that makes your mixture sweeter than you like, you can always add lemon juice to minimize the sweetness. 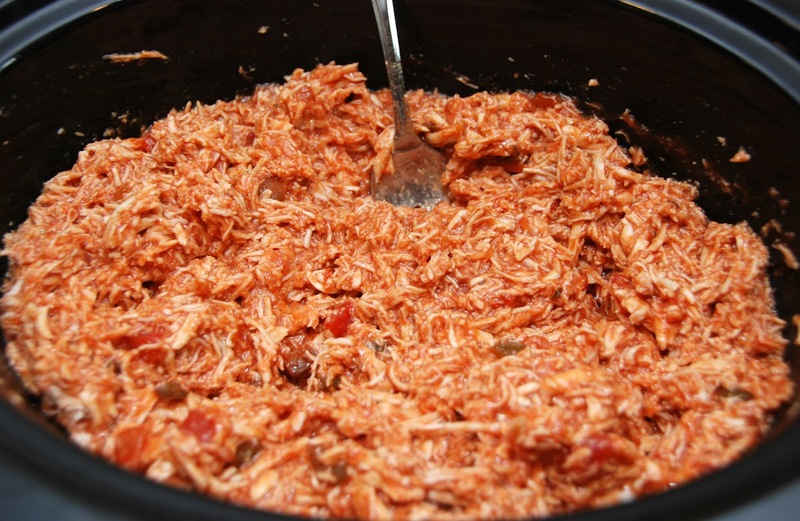 Once you have shredded your chicken breast add it to the salsa mixture and stir until the chicken is evenly coated. If you are serving it the same day you can just leave it in your crock pot. If you are making it ahead of time you can put it in storage containers and refrigerate it. The day you serve it you can reheat it on the stove, in a crock pot, or in the microwave. This recipe does freeze really well. I usually freeze it in single servings and pull them out as we need them. Once the chicken pull has been frozen, I find the best way to reheat the it is on the stove top. Thanks! And thanks for the follow!! I linked up and followed you, what a great idea for a party! Your link came through fine on Food on Friday too. Have a great week.